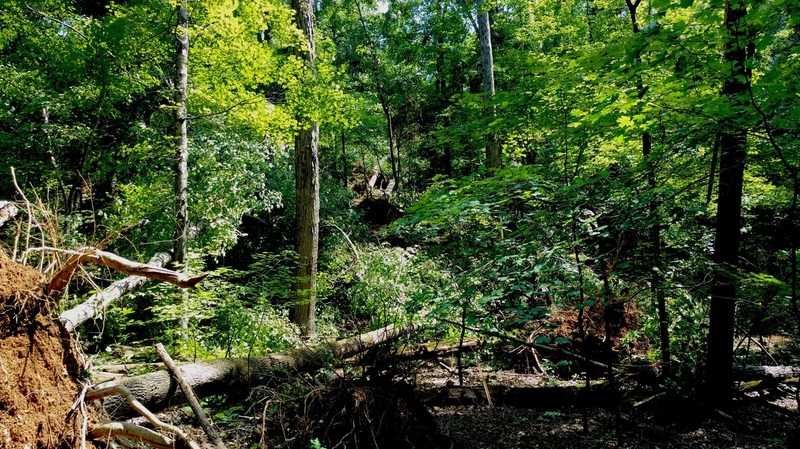 The Forest Service at Land Between the Lakes National Recreation Area in western Kentucky has proposed commercial timber harvests on approximately 120 acres in response to a tornado that impacted the area on July 6. 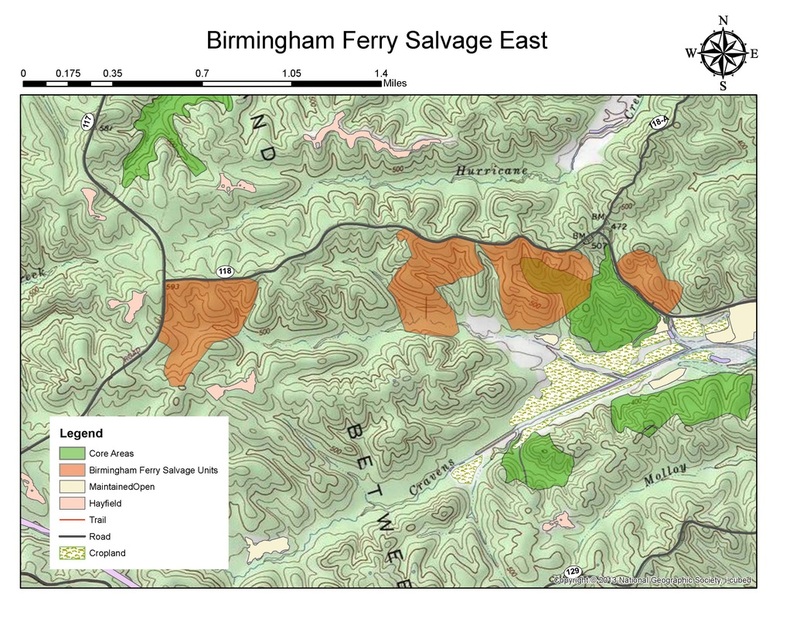 Most of the harvests proposed in the Birmingham Ferry Salvage Project are on the north end in the Birmingham Ferry/Pisgah Bay area near Kentucky Lake and the Cravens Bay area near Lake Barkley. There are several problems with this proposal, and we encourage the public to submit comments in opposition. While the Forest Service has already been able to clear most roads and trails, they have chosen to propose to harvest timber under a “Categorical Exclusion,” or “CE,” which means that there will be no Environmental Assessment and only one opportunity for the public to comment. Comments must be submitted by September 30, 2016. Kentucky Heartwood's comments for reference, and information on writing comments that the Forest Service will accept are on down this page, along with lots more information and background on the project proposal. Maps showing details of the proposed project area, including Core Areas, are below. The Forest Service hosted a field trip in the area on Friday September 16, 2016. A news story was aired on local television station, WPSD Local 6, and can be viewed here. Natural disturbance events like tornadoes and ice storms are as much a part of the forest as leaves falling in autumn. While it can sometimes be sad to see trees fall, the fact is that broken, dead, and dying trees are often an important part of natural, healthy forests. They provide habitat and food, and create “gaps” in the forest where different species thrive and new trees grow. Neighboring trees, relieved of competition, can grow faster while the forest moves toward the more complex structures characteristic of old-growth forests. Good forestry practices work to mimic natural disturbance, but also come with unavoidable impacts. The Forest Service will have to bulldoze temporary roads in the forest, establish skidder trails, and build large log landings to stockpile and load logs. These disturbances to the forest floor create ideal conditions for infestations of non-native invasive species in forest interiors. While not currently proposed, multiple follow-up treatments with herbicides or intensive manual efforts will likely be needed deal with invasive species. ​About 42,000 acres, or one quarter of Land Between the Lakes, is designated as “Core Areas.” These special areas are supposed to be managed without timber sales and for the development of old-growth characteristics, and to operate as a comparison to more intensive management elsewhere. 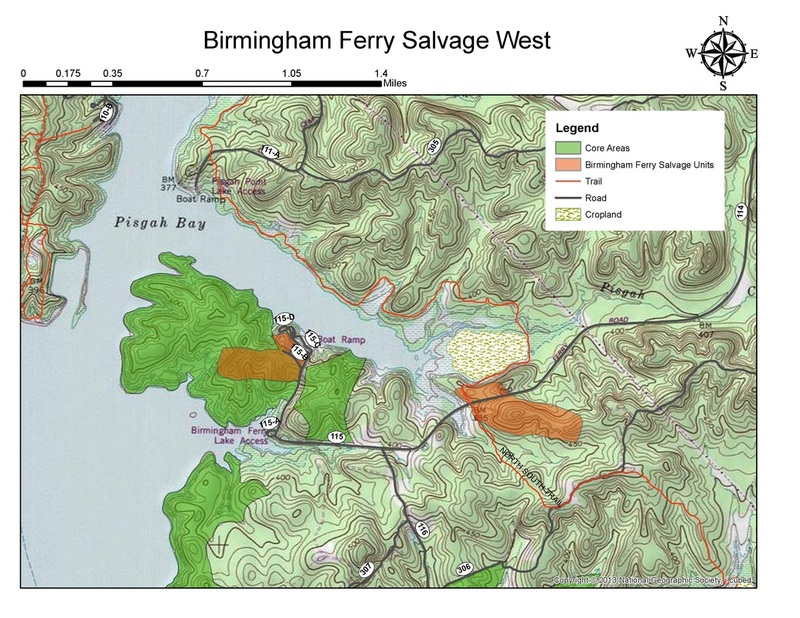 Though the Forest Service did not disclose this information in their proposal, the salvage areas include 28 acres of the Pisgah Bay Core Area and another 19 acres of logging in a Core Area near Cravens Bay. Logging these areas goes against the expressed intent of the Core Area designation in the Area Plan. The Forest Service cites their interest in reducing the risks of “catastrophic" wildfire as well as potential insect and disease outbreaks as their purpose for harvesting timber. Wildfires are not common at LBL, and because nearly all of LBL is bounded by water there is little risk of fire impacting private property (in fact, fires started in the project area would have to travel more than 30 miles to reach private property). The Forest Service even insists elsewhere that most of LBL is a fire adapted landscape and would benefit from fire. As for forest health risks, the impacts from the tornado are normal, natural, and not on an extraordinary scale. Any insects or disease resulting from tree damage should be localized and a normal part of the forest’s ecology. The Forest Service says that they plan to log “approximately 120 acres” within a 230-acre salvage area, but are lacking in specifics. The only location information they’ve provided in their maps actually includes over 300 acres across 7 salvage units. They haven’t provided any information about the locations or sizes of log landings and temporary roads, or criteria for the trees that they plan to harvest. And while Forest Service officials have stated verbally that they don’t plan to log any Core Areas, they nevertheless included them in their proposal without disclosing this information to the public. Usually these issues can be addressed in an Environmental Assessment, but because the Forest Service has decided to use a Categorical Exclusion with no Environmental Assessment or future opportunities for public comment, the public is being left largely in the dark. ​Comments are due by Friday, September 30, 2016. Be sure to include “Birmingham Ferry Salvage” in the subject line. Kentucky Heartwood's comments (see document below) were sent to the Forest Service on September 16, 2016. Please feel free to refer to the information in these comments as you write your own, but be sure not to use them as a form letter. Form letters are not "counted" by the forest service. They also do not count "petitions." It is effective to write comments that explain how you personally see the issue, and how it affects you. If you have a cultural connection to the Between the Rivers area, make sure you say so. Cultural ties are very important here. If you hunt, or hike, fish, ride or recreate any other way in LBL, say so in your comment letter. Another idea that was discussed by local residents and Lyon County Judge Executive Wade White, was that downed wood near the road should be made available as firewood for the public. "I also ask the public to help with the cleanup! Did you know anyone wanting to cut wood and leave it for campers may do so by cutting any downed tree in this area. Also if you want to take that wood outside LBL there is a $20.00 yearly permit. The Forest Service has welcomed your participation. You need wood? Help with the clean up today and we can solve this problem within weeks without logging." White said in a released statement. Here is a local news story about the issue, including video showing the tornado-hit areas participants in the field trip.